Zhangjiajie (simplified Chinese: 张家界; traditional Chinese: 張家界; pinyin: Zhāngjiājiè) also known in Tujia language as Zhangx jif avlar (dzaȵ˩ ji˥ a ˩la˥) is a prefecture-level city in the northwestern part of Hunan province, People's Republic of China. It comprises the district of Yongding, Wulingyuan and counties of Cili and Sangzhi. Within it is located Wulingyuan Scenic Area which was designated a UNESCO World Heritage Site in 1992 as well as an AAAAA scenic area by the China National Tourism Administration. The city itself was previously named Dayong (大庸), and has a recorded history dating back to 221 BC. People lived here along both banks of the Lishui River (the mother river in Zhangjiajie), now within the boundaries of Zhangjiajie City, very early during the Stone Age. Human settlement in this region dates back 100,000 years, rivaling such famous sites as Xi’an, Beijing and others. In 1986, the Academy of Chinese Social Science discovered Stone Age relics in Cili County, unearthing 108 articles of stoneware; mostly tapered-form, hacked-tamped and plate-shaped works. According to archaeological experts’ textual research, all of these wares were produced about 100,000 years ago. Shortly thereafter, in 1988, the Archaeological Institute of Hunan Province found other relics in Sangzhi County, including three pieces of stoneware which were estimated to have been fashioned over 100,000 years ago. Ten thousand years ago, those who lived within the boundaries of what is now Zhangjiajie City employed fire to bake pottery. Archaeologists have found more than 20 relics of this kind in Cili County, while in Sangzhi County, a black clay pot adorned with a unique design was unearthed dating back ten thousand years. During that period, this pottery-firing technique was the most advanced in China. These technological advancements in the fashioning of stone tools and pottery would seem to indicate a highly developed culture in this region. However, the society which developed only endured briefly before waning and being superseded by other regional powers. This seems understandable in view of Zhangjiajie's remote geographical position, its undeveloped land and river transportation, and its mountainous terrain making cultivation difficult. For these reasons, Zhangjiajie has been labeled "the Land of the Savage Southern Minority" since the earliest recorded history. Additional name descriptors have been the "Wuling Rude People" and "Tujia Rude People", indicative of discriminatory views held against the regional culture. The new name of Zhangjiajie City was adopted in 1994, after the National Forest Park in the Wulingyuan Scenic Area (武陵源) in order to give it more prominence and after this site had been designated a UNESCO World Heritage Site in 1992. The National Forest Park had been given the name of Zhangjiajie after the name of a small village located within its bounds, and now a popular tourist attraction within the park. The three-character name (张家界) can be interpreted as follows: "Zhang" (张) is a common surname in China; "jia" (家) can be translated as "family"; and "jie" (界) can be translated as "homeland", giving the completed translation of "Zhang family homeland." It has been reported that at least one tourist guide has said that the name may have been chosen to convey the idea or impression of "Open the family door to welcome the world" (张开家门引进世界), but this is not the locally accepted and directly-translated meaning of the name. The official version of its name is linked to a Han general, Zhang Liang, who resettled in the area after a suspicious Liu Bang, the Han emperor, started to persecute his staffs and generals who had contributed to his becoming emperor. It was so named to signify that the Zhang family had set up home there. 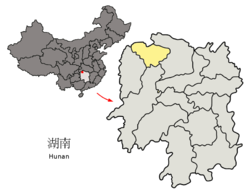 Zhangjiajie administers two districts and two counties. The current CPC Party Secretary of Zhangjiajie is Guo Zhenggui and the current Mayor is Liu Ge'an. The Zhangjiajie Hehua International Airport services scheduled service to major airports in China. It is about 5 km (3.1 mi)away from the downtown and 30 km (19 mi)away from Wulingyuan Scenic Area. There are domestic flights available between Zhangjiajie and other cities, such as Changsha, Beijing, Shanghai, Guangzhou etc. Flights between Zhangjiajie and Seoul, Busan are also available. Due to tourism, G5513 Changsha–Zhangjiajie Expressway linked provincial capital Changsha and Zhangjiajie. ^ "AAAAA Scenic Areas". China National Tourism Administration. 16 November 2008. Archived from the original on April 4, 2014. Retrieved 9 April 2011. 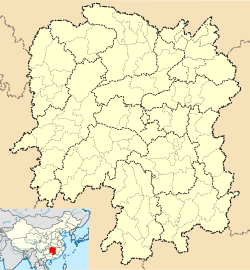 ^ "Tujia language". Zhangjiajie Municipal Government. 23 November 2010. Retrieved 10 July 2014. ^ "The Origin of Zhangjiajie Name". Zhangjiajie Municipal Government. 20 November 2013. Retrieved 10 July 2014. Wikimedia Commons has media related to Zhangjiajie. Wikivoyage has a travel guide for Zhangjiajie. This page was last edited on 19 January 2019, at 20:50 (UTC).